- Male Strippers » » Male Strippers Gallery » Usher; concert or male strip show? 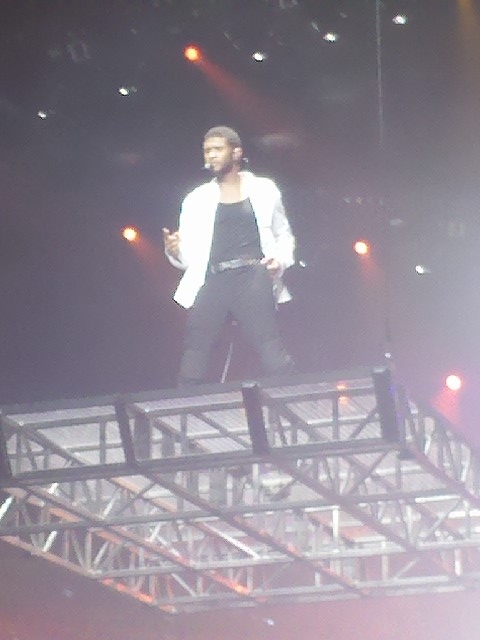 Usher; concert or male strip show? Posted on December 15th, 2010. Filed under The Head Hunk Has Spoken. I took a lady friend with me to the Usher concert last night at Madison Square Garden. Miguel and Trey Songz opened up for him. The constant dance theme from all 3 performers were old Michael Jackson moves. I little plaid out is you ask me. I really do appreciate the singing talent of these artists. They are truly fine singers. Miguel and his band were fun to watch. The dueling guitars were classic. One thing I didn’t appreciate is the whole self serving, ego feeding attitude of Trey Songz. After stripping out of his shirt, he actually asked the girls in the crowd “who wants to come home with me?” Of course all of the under 21 and ugly girls screamed. This and similar actions took away from his true artistic quality. Usher is Usher. Can’t take anything away from him. Still a little too much Michael Jackson in his steps for me. Also felt like a male strip show with his shirt off and giving a lap dance to a random J.A.P. from the crowd. All in all, I’m happy I went. Real singers don’t and should do that stuff. Leave that to the Britney Spears of the world. This entry was posted on Wednesday, December 15th, 2010 at 9:51 am	and is filed under The Head Hunk Has Spoken. You can follow any responses to this entry through the RSS 2.0 feed. You can leave a response, or trackback from your own site.